When booking hotels and guest-houses in Chiang Mai, a number of first-time visitors automatically assume the accommodation will be in the central part of the city. Whilst that may be true in many cases, it’s also important to note that Chiang Mai is the name of a province as well as the city. 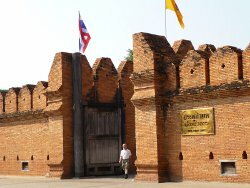 The provincial area of Chiang Mai incorporates a number of satellite towns and villages as well as more remote rural areas. For this reason, if you want to be in the heart of the city of Chiang Mai make sure you check your hotel’s location before booking so that you aren’t disappointed. The historic old town district of Chiang Mai is an excellent place to stay if you want to explore the dozens of temples and historic sites. The old town area is contained within a square that is surrounded by the remains of the old city walls. A moat (canal) also runs around this square. The lack of traffic and the compact size of the old town make it is an easy place to explore by foot or by bicycle. Many of the budget guest-houses popular with backpackers are contained in the small sois (lanes) close to historic Thapae Gate. For those looking for more comfort, there are also some excellent boutique hotels within the old town of Chiang Mai and staying in this area puts you close to the excellent Sunday Walking Street Market. 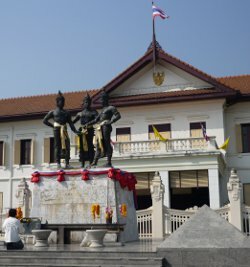 This is also a good place to stay to experience any of Chiang Mai’s many festivals and exhibitions with the area in front of the Three Kings Monument being the usual focal point. The locations in and around the Night Bazaar can be described as Chiang Mai’s downtown area. Much of the city’s mid-range tourist accommodation is centred here and there are numerous restaurants and bars close at hand. Staying in Chiang Mai’s night bazaar area puts you close to the Ping River and you are also within reasonable walking distance to Thapae Gate and the old town district. Chiang Mai has plenty of accommodation options away from the old town and downtown areas. Staying away from the main tourist areas can give you another perspective of the city and it’s still easy enough to travel to other parts of the city by songthaew (red bus/taxi) or tuk-tuk. A number of hotels also provide free shuttle services to other areas of the city including the Night Bazaar. To the north-west of the old town is Nimmanhaemin Road which is home to some of the most exclusive shops and boutiques in Chiang Mai. There are some excellent hotels to be found here as well as an abundance of cafes, restaurants and coffee shops. The proximity of this location to Chiang Mai University attracts a young and trendy crowd to the bars and clubs in the area. Another area close by is Suthep Road which is the location for Wat Suan Dok and Wat Umong. The busy Suthep Road area is popular with locals and students, but tucked away in the quiet lanes there are a few hidden gems including the Ayatana Hamlet & Spa. Staying in Chiang Mai city is convenient for sightseeing, but there are also a number of accommodation options if you want to stay in the countryside. Within a 30-minute drive from the centre of the city, there are some quiet retreats with beautiful views of the Chiang Mai countryside. A number of these hotels can also arrange transport into the city for you.